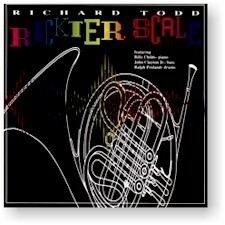 If you think of the horn only as the "polite" voice of the orchestra, if you've never considered it as a jazz instrument on par with trumpet or saxophone, if you don't believe that a superb classical musician could ever loosen up and blow a hot solo with the best of them... then you haven't heard Rick Todd. A renowned concertizing soloist, orchestral player, and one of the busiest studio musicians in Hollywood, Rick is also a familiar face in the jazz clubs of southern California. His style-hopping fluency and superb technique are redefining the way people think of the French horn, and he is adding a new and singular voice to the sound of jazz. On Rickter Scale -- his second GM release, Todd is joined by the great west coast rhythm section of pianist Billy Childs, bass player John Clayton, and drummer Ralph Penland for a set ranging from the bebop anthem "Anthropology" to Duke Ellington's "In a Mellotone" to Chick Corea's driving "Got a Match, as well as several original tunes. Also features is a gorgeous eight-horn arrangement by the late David Rose of his classic ballad "Our Waltz." "This CD displays for us a star among jazz Hornists, exploring the medium to discover an authentic Horn voice. Schuller notes do a fine job of placing Todd in perspective. Schuller says, 'Sit back, relax and enjoy; be stimulated, entertained and challenged, and amazed!' I did, and I was!"